A “Planting Ritual” is such a lovely addition to wedding ceremonies. Not only is it a green thing to do, it is a meaningful and mindful symbol of two families rooted in tradition coming together to witness their loved ones starting new growth as a couple. How simple and beautiful is that? 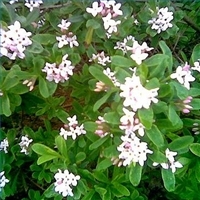 And one of my favorite plants to use is Daphne. The pink blossoms and green leaves represent the colors of the heart and the fragrance is unbelievably sweet. It’s also one of the first shrubs to bloom – sometimes even as early as February.